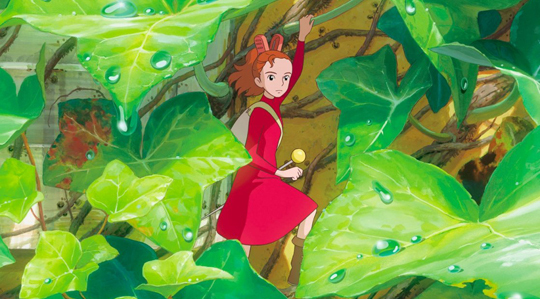 Acceptable face of anime Studio Ghibli are back in a big way this week with Arrietty, their decidedly understated take on Mary Norton’s The Borrowers. Don’t expect any furious John Goodmans or adorable nine-year-old Tom Feltons this time around though, because Arrietty is one of those ‘timeless’ kids films you’ve read about in all the Sunday supplements. In other words, it’s got a Pretty Lady Voice singing all over it. I saw the film with subtitles (because it was the only version on offer, not because I’m one of those insufferable cunts who insists it’s just ‘not the same’ when you watch a dubbed version) but given how squarely it seems to be aiming at young children it’s hardly surprising that Optimum are pushing the translated version. They’ve even made the unorthodox move of recording a UK dub featuring Saoirse Ronan, Mark Strong and Olivia Colman instead of just carrying across the US recording, which stars Amy Poehler and Will Arnett. Older audiences might be disappointed by the film’s complete lack of conflict or threat, as well as some of its less-than-subtle dialogue (‘You have a family? I envy you.’) but it’s hard to care too much when the whole thing is so effortlessly charming and exquisitely beautiful. And if nothing else, you can sit there and smirk to yourself about the logistical nightmare that is a borrower falling in love with a human being.